Harrogate Town kept their National League North title bid on track with a 2-0 success over local rivals York City, on Saturday. 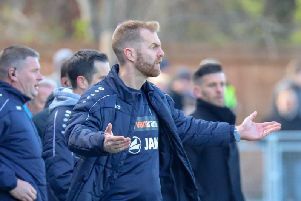 Victory from their first ever compeitive trip to Bootham Crescent ensures that Simon Weaver’s team remain just three points behind leaders Salford City with four games of the season remaining. Click on the above link to a gallery of pictures by Matt Kirkham of Town Pix to see how exactly how Town’s derby day win unfolded.